After breakfast at the hotel, you will be collected from your hotel in Bangkok and taken to the Floating Market. You will take a long tail boat to the edge of the Floating Market and ride in a paddleboat through the Floating Market. You’ll then walk around and observe the sale and exchange of various goods between parties in their long tail boats as has been traditionally taking place for years.After breakfast at the hotel, you will be collected from your hotel in Bangkok and taken to the Floating Market. You will take a long tail boat to the edge of the Floating Market and ride in a paddleboat through the Floating Market. You’ll then walk around and observe the sale and exchange of various goods between parties in their long tail boats as has been traditionally taking place for years.Back to Bangkok for the visit to some highlights including the Grand Palace which is the official of King Siam since 1782 made up of numerous buildings, halls, pavilions set around open lawns, gardens and courtyards. It is located on the bank of Chao Phraya River. Inside the Grand Palace complex is Wat Phra Kaeo or Temple of the Emerald Buddha – the most beautiful and sacred Buddhist temple in Thailand. The following visit is Wat Arun which is known as Temple of Dawn – one of the best well-known sites in Bangkok. It is best seen from the opposite side of the river. The remainder of the day is free at your leisure. Take a drive of around 2.5 hours to Pattaya. From here, you will discover some highlights of this city including Sanctuary of Truth which is one-of-a-kind teak structure; a truly awe-inspiring sanctuary to a philosophical truth, which tells of the importance religion, philosophy and art has played in human development and the folly of neglecting morality and spiritual contentment in the pursuit of materialism; Art in Paradise where takes the traditional assumptions of what an art gallery should be and completely ignores them. Take a drive of around 2.5 hours to Pattaya. From here, you will discover some highlights of this city including Sanctuary of Truth which is one-of-a-kind teak structure; a truly awe-inspiring sanctuary to a philosophical truth, which tells of the importance religion, philosophy and art has played in human development and the folly of neglecting morality and spiritual contentment in the pursuit of materialism; Art in Paradise where takes the traditional assumptions of what an art gallery should be and completely ignores them.In the afternoon, you will enjoy Alcazar show. You'll love every minute you spend in Alcazar. On stage is a bevy of professional entertainers presenting artistic impersonations through songs and tales of love and adventure with a fantastic sound and light show. After breakfast, (join-in) transfer to Pattaya boat pier board on speed boat and depart to Koh Larn for beautiful island and coral reef. This is nice place for snorkeling and relaxing on the beach. Lunch at a local restaurant on the beach in Ko Larn. Spend the leisurely time for swimming, snorkeling, water-skiing, para-sailing or just relaxing and sunbathing. Return to Pattaya and free on your own. You will be free until transferring by driver to the airport for the flight to Phuket. Upon arrival, the driver will meet you & drive to your hotel for a few days of beauty and relaxation. Overnight at hotel in Phuket. 07:30am – 8.00am (join-in) pick-up at your hotel and transfer you to Phuket Royal Marina pier where is the gate way to the islands. 09:00am depart Phuket Royal marina pier for Phi Phi island. 09:45am arrive at Monkey Beach (Phi Phi Don island) for taking pictures of playful Monkeys which they living there nearby the beach. 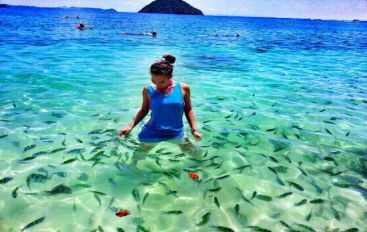 Sightseeing Viking cave (Gypsy cave) and go to swimming at Phi Leh Lagoon and wonderful snorkeling experience at Loh Sa Ma Bay. 12:00pm fantastic lunch time at Beachfront restaurant on Phi Phi Don island. 13:00pm visit Maya Bay for relaxation on the beach. 14:30pm last stop, visit at Khai island for relaxing and swimming by your own leisure. 16:00pm leave Khai island with good memory heading back to Phuket. 16:30pm transfer you back to your hotel. After breakfast, you will transfer to the airport for your flight back to Bangkok where you will wait for your departure flight home. Bon Voyage! We had an outstanding trip. The tour director and staff were fantastic and took great care of us, providing snacks, education, and first class service all day. Towels were provided as well as a light breakfast before our trip. We had water noodles to help us float while snorkeling and disposable mouth pieces to keep the gear hygienic. The guide made sure we all got to see the Black Tip Sharks while we were snorkeling. I highly recommend this company and really appreciated doing the early tour to avoid the crowds!